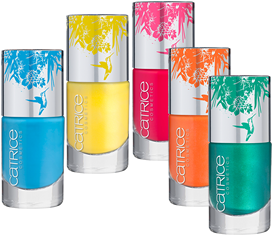 I'm deeply in the summer brights mood right now, when I saw promo images of this collection I fell in love with the polishes, I must have them! Non so voi, ma io probabilmente sono entrata di colpo nel mood estivo, perché ho di nuovo voglia di manicure super colorate e quando ho visto questa collezione ho pensato "deve essere mia"...Se la vedete in giro fatemi sapere, qui per trovare la Catrice devo organizzarmi :-) (uffa la vorrei anche negli Ovs), grazie! Fantastic and full of color – the coolibri with bright, colorful feathers from the depths of the Amazon. Its mysterious home and breathtaking blaze of color offer the inspiration for the contrasting and fashionable colors of the 2012 summer season catwalk looks with intensive, bright color blocking – and is reflected in the Limited Edition “Coolibri” by CATRICE. In June and July 2012, sunny yellow and rich green shades, cool turquoise blue, warm orange-red and fresh pink whisk you away to the iridescent world of Amazon colors. The ideal make-up for summertime – fascinating, light and radiantly beautiful! Ultimate long-lasting texture, ultimate coverage, ultimate color in the brightest Coolibri varieties! High shine with or without shimmer – these bold nail polishes are sure to fulfill all exotic color wishes. Really? I'm so eager to see them IRL :-P do you already saw them in Slovenian stores?